Creatine supplements are well known to increase high-intensity athletic performance and researchers have reported the use of creatine as an energy source by skeletal muscles since the middle of the 20th century. There is scientific evidence that short term creatine use can increase maximum power and performance in high-intensity anaerobic repetitive work (periods of work and rest) by 5 to 15%. This is mainly bouts of running/cycling sprints, powerlifting and multiple sets of strength training with few repetitions. Single effort work shows an increase of 1 to 5%. This refers mainly to single sprints and single lifting of 1-2RM weights. However, some studies show no ergogenic effect at all. Studies in endurance athletes have been less than promising, most likely because these activities are sustained at a given intensity and thus do not allow for significant intra-exercise synthesis of additional creatine phosphate molecules. Ingesting creatine can increase the level of phosphocreatine in the muscles up to 20%. Creatine has no significant effect on aerobic endurance, though it will increase power during short sessions of high-intensity aerobic exercise. Pure Micronized Creatine Monohydrate – 99.99%. This is our first choice when it comes to creatine supplements, having tested several different brands over the past few months. Creatine Monohydrate powder is taken from the compound Creatine, which aids the process of sending energy directly to muscle. It is naturally produced by the body in organs such as the liver, pancreas and kidneys, and it can be found in areas as diverse as the brain, heart and all muscle tissue. It can be derived from Glycine, Methionine, and Arginine, three very important amino acids, and also from red meats and fish, which typically contain about 2-2.5 grams per pound. Creatine Monohydrate has been shown to help increase overall muscle mass as well as strength, as long as it is taken in conjunction with a healthy diet and exercise. It also extends the time of the average workout by giving the body more energy to spend, making it a popular choice among athletes and bodybuilders. With the benefits of creatine being widely known and understood by those who use them, our aim here was to review several products and present our favourite, creatine monohydrate being the most tested type. This product from BulkSupplements is a no-nonsense, no-frills creatine source and comes packed in a silver re-sealable bag shown in the photo. The product is a fine white powder substance, with an appearance similar to flour and easily mixes in water, although you might need to add more water to finish a small amount that may settle at the bottom. This product has a very subtle taste, almost no taste at all in fact, which demonstrates that it is based on pure creatine with no added sugar, fillers or gimmicks. Depending on your particular workout regime, experiment with the dosage to find what suits you best in terms of loading, cycling, and timing, or if you don’t load or cycle, take it just before a workout. It usually kicks in about 30 minutes or so into workouts, and is noticeably helpful in finishing off an intense session. Most people take it on non-workout days too. Dosage for most people will be around 2.7 grams to about 3.5 grams on the higher end, which is roughly up to 1.5 teaspoons. There aren’t any noticeable side effects, although you should drink a lot of water and stay hydrated as per usual, in which case going over that dose probably won’t be an issue, but to be safe, if it’s the first time you are using creatine, we suggest starting out on the conservative side, which, as a dietary supplement, is about 2500mg (1/2 tsp) to 5000mg (1 tsp) daily, preferably before a workout or as directed by a physician. Individual needs vary greatly. Be sure to drink plenty of water. The good, most important thing about this product is the fact that it’s almost 100% pure creatine with no add-in fillers. Our second choice is Naturo Nitro Creatine Chrome with Magnapower™ – Rapid Muscle Gain, Increased Muscle ATP and Cell Volumization from Naturo Nitro. Advanced Creatine System Fuels Your Body with More ATP. No more Loading Phases or Bloating. Our advanced creatine complex is absorbed by your body ultra-fast. Naturo Nitro Creatine Chrome contains Creatine MagnaPowder. Speeds Up Muscle Recovery And Fights Fatigue. This advanced Creatine System Fuels Your Body with More ATP and Amplified Energy. Naturo Nitro Creatine Chrome contains Creatine MagnaPowder™ which is an advanced, patented form of creatine called magnesium creatine. Scientific studies reveal this form of creatine is absorbed by your body faster than creatine monohydrate, although from our tests we didn’t really notice a difference. Creatine is basically a fuel source for ATP, which is an energy system for your muscles. With more ATP in your muscles, you’re able to train longer and harder, resulting to massive gains in strength in size. Anyway, this floods your muscles with ATP (energy) allowing you to power through workouts and experience incredible gains in strength, size, and lean muscle mass. Most users notice a difference in their first dose and it maximizes Lean Muscle Mass and Size. Naturo Nitro Creatine Chrome works by increasing the supply of ATP in your muscles. When this happens the cells in your muscles get bigger as a result of all the additional ATP. This allows you to train harder, lift heavier and longer, leading to massive muscle gains. Creatine has also recently been shown to be a myostatin inhibitor, meaning it prevents the myostatin protein from being synthesized by your skeletal muscle. Creatine promotes lean muscle mass, acts as a support system to prevent against muscle breakdown, and aids in muscle recovery. Creatine also enhances the ability to produce higher muscular force, especially during short bouts of maximal exercise such as powerlifting. Magnesium is essential for over 300 bodily functions. It has been shown to enhance strength, energy, and endurance levels. The most important aspect of magnesium’s relationship to creatine is that creatine requires magnesium for maximum conversion to Adenosine triphosphate (ATP) also known as energy. Firstly, the capsule is rather large, so it can be a struggle if you don’t do well with pills like me. However, it goes down smoothly and doesn’t end up stuck in your throat once you get used to it, although for me I would still prefer the powder. Benefits were good, and there was no bloating or constipation. I also noticed that it helps me to visit the gym more often than before. I used to have to alternate leg and arm day, so that I could rest those muscles for extra periods of time but now I don’t need to do that. As a dietary supplement take 3 capsules with 8oz. of water 30 min. prior to exercise. 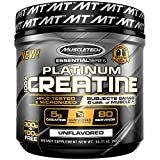 Two other products we tested that I will list here as runner ups, are Optimum Nutrition Creatine Powder, Unflavored, 600g from Optimum Nutrition and MuscleTech Platinum 100% Creatine, Ultra-Pure Micronized Creatine Powder, 80 Servings, 0.88 lbs (400g). Increases muscle strength and power. Improves performance in high-intensity exercise. Increase energy levels and speed up recovery rates. Enhance energy reserves in muscles while minimizing protein breakdown. Dietary Supplement. 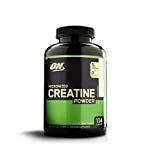 Each serving (one teaspoon) of Optimum Nutrition’s Creatine Powder supplies 5 grams (5000 mg) of Pure Creatine Monohydrate. The patented production method used to produce this Creatine yields a tasteless, odorless powder that mixes easily into water or juice and does not readily settle to the bottom. As a result, the gritty taste or texture you may have experienced with other Creatine powders is not associated with this product. At $14 for 600gms is more expensive than our first choice. Clinically tested HPLC-tested micronized creatine. Ultra pure micronized creatine powder. Best sources for uninterrupted supply. Delivers a clinically tested HPLC-tested micronized creatine for good absorption, but at just over $10 for 400gms is slightly more expensive than our first choice. Both of these have similar claims and capabilities, but for overall value for money and purity, BulkSupplements Pure Micronized Creatine Monohydrate Powder is our number one choice, mainly because you get 1kg of 99.99% pure creatine powder which is easily mixable in water and does exactly what it claims with no extra fillers or ingredients. A 1kg pack, even with a higher average dose of 5gms, would last for 200 sessions for $19, which is very good value. Our second choice; Naturo Nitro Creatine Chrome with Magnapower™ – Rapid Muscle Gain, Increased Muscle ATP and Cell Volumization is good because of the added magnesium, but is quite a lot more expensive at around the $20 mark for 90 capsules, which will last you around 30 workout sessions at the recommended dosage of 3 capsules before each workout. Unfortunately, creatine is one supplement that must be taken with precision otherwise expectations will probably not be met. Now, that said, there are a few different ways that you can go about incorporating this supplement into your routine, which is what we based our tests on. Usually the most common way people take creatine is to start off with a loading phase which is designed to fully saturate the muscle’s stores of creatine, then move onto a maintenance phase where the dose is lowered to keep levels where they need to be. This is typically done by using 20 grams of creatine over a five day period. However, we didn’t do this for the basis of our tests, partly due to time and partly to avoid any chance of bloating or gastric upset. So, for those who really don’t want to load at all, just opt for 5 grams of creatine taken over the span of a month, which is what we did. (5 grams of creatine is around one teaspoon). If you do subject yourself to a loading period, once you have done that, move to maintenance. Some people will maintain on five grams per day, but for most individuals, 2-3 grams each day will be sufficient. One more thing to note; if creatine is going to be beneficial for you, you need to be taking it on a constant basis, not just ‘here and there’ as you feel. 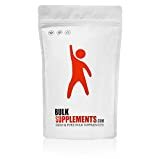 Definitely if you are very low in creatine stores and perform a loading phase this should help your workouts, but if you are to sustain the benefits that creatine offers, you need to keep those stores up thereafter. Creatine gets into your muscle cells quicker if an insulin spike is present, which is why you often hear the recommendation to be taking it with juice, usually either grape or orange, although it doesn’t matter which. Remember though, even better than taking it with juice, will be mixing it up with your own dextrose, as juice is part fructose, which will have minimal effects on insulin levels. Furthermore, because of this reason, creatine is often best taken in post-workout period, as this is when muscle glycogen is going to be most susceptible to filling their stores. During the loading phase though, you must split the dosages up and take it over two or three times during the day as this will simply be too much for your body to handle at once. Taking it with something, be it a post-workout shake comprised of carbs and protein or a full-fledged meal, is a good idea because this will help to reduce the chances that stomach upset is seen in those who are more sensitive to it. Finally, don’t think that creatine is only beneficial for those who are involved in heavy-weight lifting. Athletes who perform a lot of high-intensity explosive sports will also greatly see results with creatine usage as their muscles will be relying on muscular stores of creatine as well. Bird, S. P. (2003).“Creatine Supplementation and Exercise Performance: A Brief Review” (PDF). Journal of Sports Science & Medicine 2 (4): 123–132. PMC 3963244.PMID 24688272. Engelhardt, Martin; Neumann, Georg; Berbalk, Anneliese; Reuter, Iris (1998). “Creatine supplementation in endurance sports”.Medicine & Science in Sports & Exercise 30 (7): 1123–1129. doi:10.1097/00005768-199807000-00016. Graham, AS; Hatton, RC (1999). “Creatine: A review of efficacy and safety”.Journal of the American Pharmaceutical Association 39 (6): 803–10; quiz 875–7. PMID 10609446.